Meena Kumari (born as Mahjabeen Bano) – the greatest actress of Indian cinema. Often portrayed as the sad, lonely, betrayed, unloved, and suffering woman (at least that is the picture we get of her). Oh! how can one forget her role of “Choti Bahu” in Sahib, Biwi and Ghulam – that woman desperate for her husband’s love. Whatever role she played- she cried, she suffered, and she died. She was the greatest tragedy queen of the silver screen in Hindi cinema…! In reality, at one point, she had everything- love, fame and money! She married the man whom she loved, she became the most successful and highest paid actress of her time, she won numerous awards, and most of her movies were critically and commercially successful. She was so successful that all young actors of that time (Rajendra Kumar, Dharmendra) rose to fame because of their association with her. Sky was the limit for Meena Kumari….yet, she died alone and penniless at the end. The book highlights a story of a young 4-year old girl who hated going to studios because she wanted to study. The same girl grew up as a beautiful young woman and became the most sought after actress of this era. With success came her restlessness, and her obsession with her own image. So obsessed she was with her own tragic image in reel life that she started believing that no one loved her and everyone around her only exploited and deceived her in real life. Her quest for true love got her into mindless numerous flings…..and all deceived her (that is what she perceived at least). The only way for her to run away from this self-created miseries was alcohol. She drank so much that ultimately she died of liver cirrhosis due to excessive drinking. hospital. 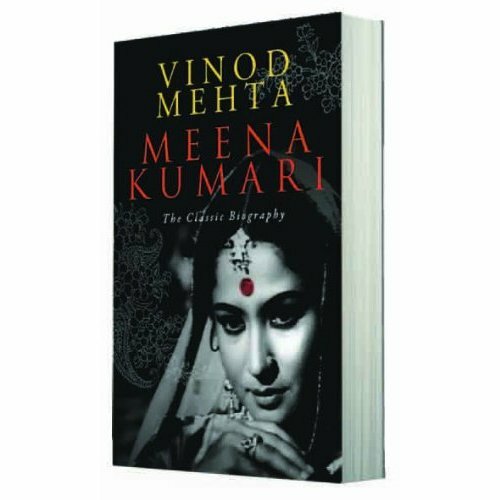 A must read book for all Meena’s fans…! Read more about Meena Kumari’s life in our blog – COMING SOON! Indeed, very interesting book and thanks so much for your comment.